How can I put this? Lylian is a very special little girl. Why? Well, she’s what you would call somewhat slightly, mental – which is probably the best word to describe her. Her parents thought so as well, so one day, within twenty minutes, they had her bags packed and bundled her into the car to be taken to Hacklaster hospital, which as you can gather, is a rather specialist hospital. Mentally unsound I believe the political term is. Lylian isn’t alone though, she has Bob, her teddy, who she made from bits of other children’s toys; she also has her brain (sometimes ideas get out of here and appear, they won’t stay in there); and she has you. 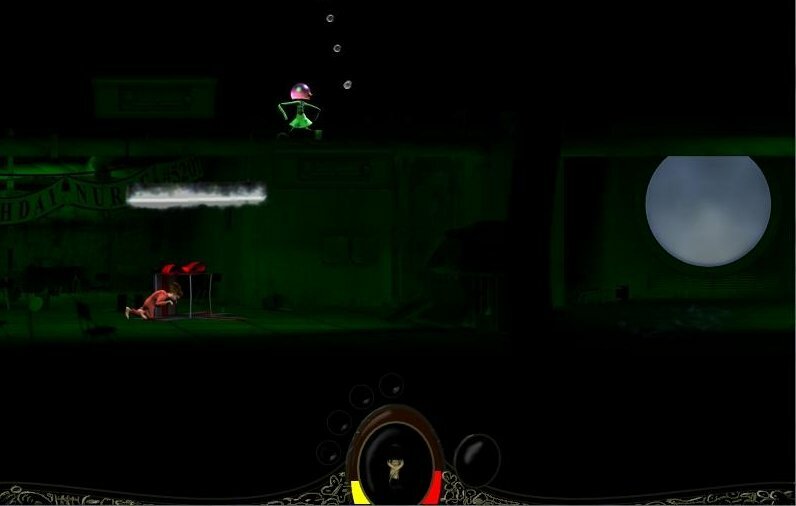 Lylian Episode 1: Paranoid Friendship from Pixelpickle Games is a wonderfully odd 2D side scroller action game. You control Lylian and her peculiar imagination as she escapes her hospital cell and finds out the mystery behind Hacklaster. This isn’t so much a game, more like a scary acid flashback! After installation, you are greeted with a superb, rather dark, graphic novel-esque cut-scene telling you the story of Lylian. After which you control Lylian, in her cell, with her strait-jacketed sleeves undone. Control is via the keyboard and is easy to get used to, however, you can re-define if you want. You have a very brief tutorial, just to get you used to the controls: running, fighting, picking up etc. After that the door opens and off you go. The inhabitants of the hospital are as equally strange as Lylian: characters such as Travis, who has a stick of chalk protruding from his nose and a fixation with bees and Lopsy, a grimy little urchin who sits all day scoffing doughnuts. They and others like them, are there to help and offer advice, (although the advice from a nutter is questionable at best), against the hospital staff, who are made up of evil nurses, rats, rat-boys, a rat-controlling chap called Lurch and Humphrey a blob of a man who, when attacked, blows up and showers candy everywhere. Told you it was odd. As you progress you begin to realise that whenever an enemy is dispatched a glowing orb leaves them and enters Lylian, this orb can replenish a small amount of health and, more importantly, feed Lylian’s imagination. At intervals, when you are powered up enough you can enter Lylian’s world. 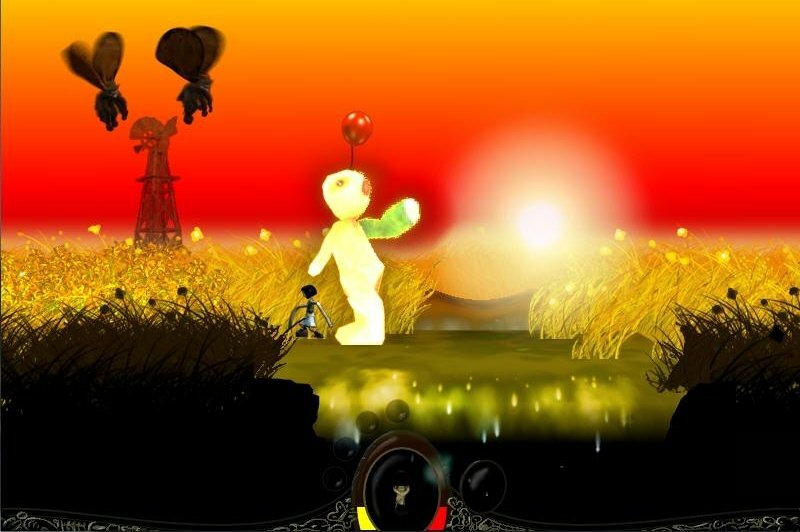 Lylian’s imaginative world is either a pleasant meadow in summer time, with long grass, butterflies and balloons, where you have to attack the bees and destroy their hive, or an underwater world that allows Lylian to bound along in great strides and jump an otherwise inaccessible area. Why? Well that would be telling wouldn’t it! Lylian can come up against huge waves of enemies at times, but just when your health meter is about to hit zero, they drop a bowl of doughnuts to replenish her health. Lylian likes doughnuts, but only the jam inside. Make it to the end of a section and, in true gaming fashion, you’ll face off against the big boss. Don’t forget to go back over your steps though, as there are a number of secrets and treasures to be had for those who can work out how to get to them. Needless to say, this game portrays a dark, horror themed look at the characters and settings, yet it is also extremely interesting and after playing you feel quite disturbed by the graphic psychological impact it throws at you. Graphics, as said, are 2D, but are beautifully animated and rendered, whether they’re portraying the bleak corridors of the hospital, the weird, tall grass, sunny meadow environment of Lylian’s imagination or the humorous looking enemies. Game play is a mix of fast action, running, leaping over pits whilst chased by a giant worm and relaxed puzzles that aren’t difficult, but when mixed with the setting of the game world make you think twice. The music and accompanying sound is very atmospheric, with a keyboard track that sets the mood of Lylian’s mental state perfectly with a slight drop in volume at intervals, followed by a sudden sharp change of tempo. For best effect play this at night with a pair of headphones. The real attraction with Lylian, however, is the well written storyline, which grabs you in an Alice in Wonderland grip and drags you down the rabbit hole faster than a magic mushroom takes to grow. The dark, comic-like genre this game is aimed at is something that hasn’t appeared on the PC scene for a while, and it makes a very refreshing change to the usual FPSs or RPGs that have sprung up literally overnight. Whether this will appeal to the PC gamer is another matter, but considering its budget price (less than a fiver) its well worth a consideration. But, here is my major gripe, Lylian Episode 1 is by far the shortest game I have ever played. Completed within an hour, followed by another twenty minutes or so going back over the levels and clearing the secrets. This unfortunately is the killing point of this, otherwise, fantastic game. I know the developer is making episode 2, but it still looks like it’s a way off yet. If they would have just held off and delivered episode 1 and 2 within a short time-span then I could have rated this higher. As it stands though, Lylian Episode 1: Paranoid Friendship is a very entertaining game, I would recommend it to anyone who has a spare few quid and who would like to try something different for a change. A game which made me question my already questionable sanity. It’s just plagiarism of A. M. A. / A. M. R., isn’t it?